I can understand leaving Mario Picross for the original Game Boy in black and white, but in this day and age a WiiWare game needs to be completely filled with vibrant splashes of color. 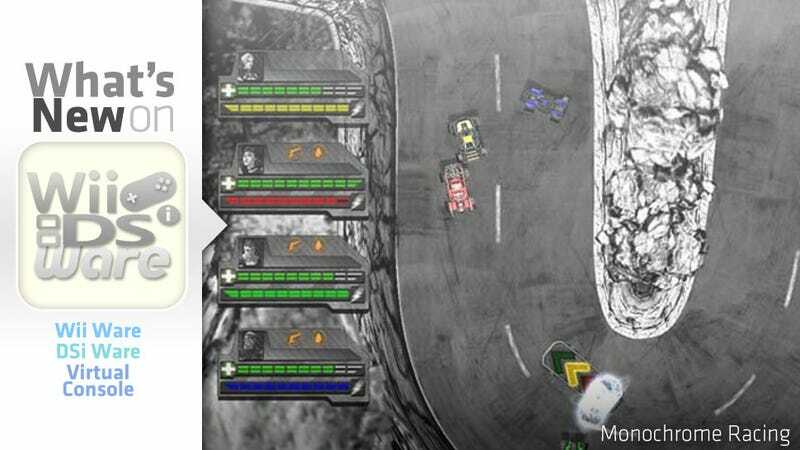 Shame on you, Monochrome Racing. I suppose it's okay to make your game mostly black and white when it's a design decision. It worked for Peter Molyneux anyway, so I'll give developer Nordcurrent a break. I mean heck, it's got 80 tracks, 10 upgradeable vehicles, and racing for up to four players simultaneously. Molyneux's game didn't even have one upgradeable vehicle, so I guess Monochrome Racing is a better racing game than Black & White. Pity it's downloadable; that would have made an excellent back cover blurb. Now that you've seen the best, check out the rest of this week's Nintendo Download, and be sure to grab a copy of Mario Picross before McWhertor snags them all. He's got a bit of a problem. Screeching tires, the smell of burned rubber, the rush of adrenaline and enemies that are left in the dust – these are the emotions that drive real racers. However there is much more than this in the world of Monochrome Racing – there is the passion for color! Color is everything here, it is what you strive for, in the world where everything is in black and white. Color is your fuel, color gives you speed, color makes you stronger and ultimately makes you the true leader of the monochrome racing world. - Immerse yourself in the mysterious monochrome world! This challenging puzzler requires logic to reveal mysterious hidden pictures! Help Mario unlock the mystery of Picross. The secrets lie in the numeric codes at the top and on the left side of each window. Decipher these numbers and uncover a hidden picture in every mind-bending puzzle. It will take quick wits and a speedy pace to solve the clues before the clock runs out. Chisel away boxes strategically and reveal the hidden image in record time. Be careful – every mistake will cost you precious minutes. There are more than 250 brain-bending puzzles to solve. Different levels of difficulty provide mind-melting puzzle action for players of any skill level. Go Fetch 2, is the sequel to the popular game with enhanced graphics, improved controls, and features a new battle mode. The idea of Go Fetch 2 is a simple, yet entertaining game. Balls are thrown and the player must guide their puppy to retrieve them. Your puppy must avoid various obstacles and collect items in order to complete missions and advance in the game. A wide variety of locations and a variety of game modes offer unique challenges for the player. Choose your puppy from different breeds, each with their own attributes. Remember, puppies are easily distracted, use your bark command to scare away cats or birds and do your best to avoid obstacles as not to waste valuable time. The different game modes, along with the exciting battle mode will provide countless hours of fun for both, you and your friends. Play & Learn Spanish is the fast, fun, and friendly way to learn to speak Spanish! Get ready for an exciting and entertaining challenge as you match the pictures to the words you hear, and see how high you can score. You'll be surprised by how much Spanish you've learned while you play! Over 700 words and phrases with entertaining visuals help you learn quickly and speak with confidence. Listen to and speak aloud Spanish words and phrases while you explore settings such as the supermarket, restaurant, and city streets. Play & Learn Spanish is easy and effective for beginners and travelers and a fun refresher for advanced and intermediate speakers!